This post includes a few great recipes I’ve tried lately. I’ve wanted to get back into trying new recipes because we’ve honestly been really lazy with dinners. I like cooking (especially making soups and stuff in the crockpot) and it was time to try something new. I don’t know that this would qualify as a “Fast” dinner but it was fairly easy. I found several recipes for the crockpot but didn’t get around to trying them. I had a free evening last week and decided to give it a try. Warm a large Dutch oven or large stock pot over high heat for a minute or two. Season beef with a pinch of salt and pepper. Add the beef to the pot. Brown the beef on two sides in two batches, takes about fifteen minutes. Once the beef is browned add it to a plate and set off to the side. Reduce heat to medium. Sauté mushrooms for three minutes. Add in the carrot and celery, sauté another three minutes, stirring with a wooden spoon or rubber spatula. Add the onion, sauté an additional two minutes. Add garlic cook for a minute. Add the beef back to the pot. Add the butter and stir in until it melts. Add the flour, stir to combine. Cook flour and butter for a minute. Pour in the beef stock and tomatoes. Add the thyme and bay leaf. Stir to combine the flour butter mixture into the soup. Bring to a simmer. Add in the barley once the soup is simmering. Cover with lid and let the soup simmer over medium/low heat for 45 – 60 minutes, until barley is puffed and tender. Remove bay leaf and thyme stems. Stir in fresh parsley and remove from heat. Let the stew cool for five minutes before serving. Stew lasts 3 – 4 days in the refrigerator in an airtight container. 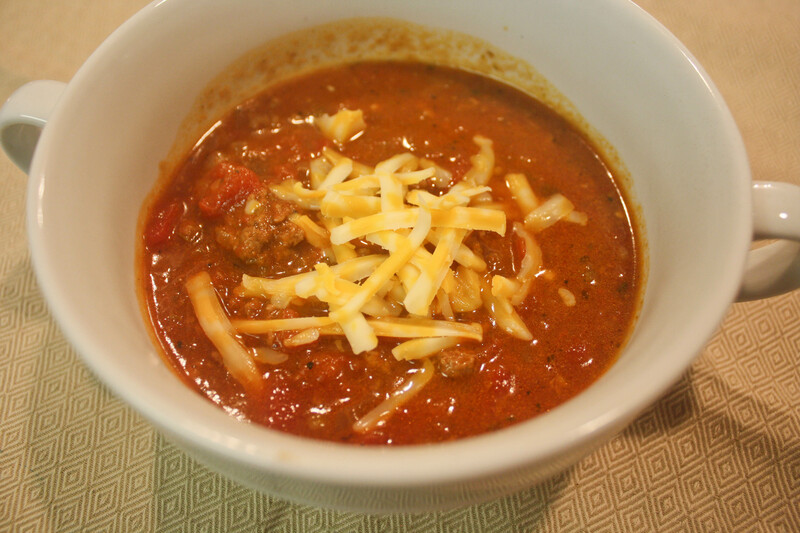 Soup will last up to a month in an airtight container in the freezer. I didn’t have celery so I added frozen peas instead. The recipe was actually quite delicious. I loved the flavors of the soup and the barley was fantastic. It might be new favorite thing. I’ve never had barley before and it went great in a soup. The meat, however, was tough. I wasn’t a fan of that and would probably make this recipe again but leave out the steak. I think it would be great as a simple barley and vegetable stew. I topped the stew with some shredded Parmesan cheese. The dinner was super filling and felt nourishing and homey. This is nothing new on the blog. Salmon is a basic meal in our house; we eat it probably once a week. Michael blackens the salmon in the skillet and we often have that with steamed veggies or on top of a green salad. Another method I use is to mix together Dijon mustard with brown sugar, pour it on top of the salmon and bake it. That’s a great one! This method is just as easy and quick and it tastes great. I spray foil with some coconut oil, lay the salmon down and season it with Lemon Pepper seasoning, a little salt, regular pepper, dried dill, fresh chopped rosemary from the garden and put lemon slices on top. I loosely wrap the foil around the salmon and depending on the thickness of the cut I bake it at 350 degrees for 15-18 minutes. Perfect salmon every time! I love the combination of dill, rosemary and lemon. This time around I cooked some jasmine rice in the rice cooker and I also roasted some carrots. For the carrots I sprinkled some grapeseed oil on them, seasoned with salt and pepper, a little of the Costco seasoning and fresh rosemary. 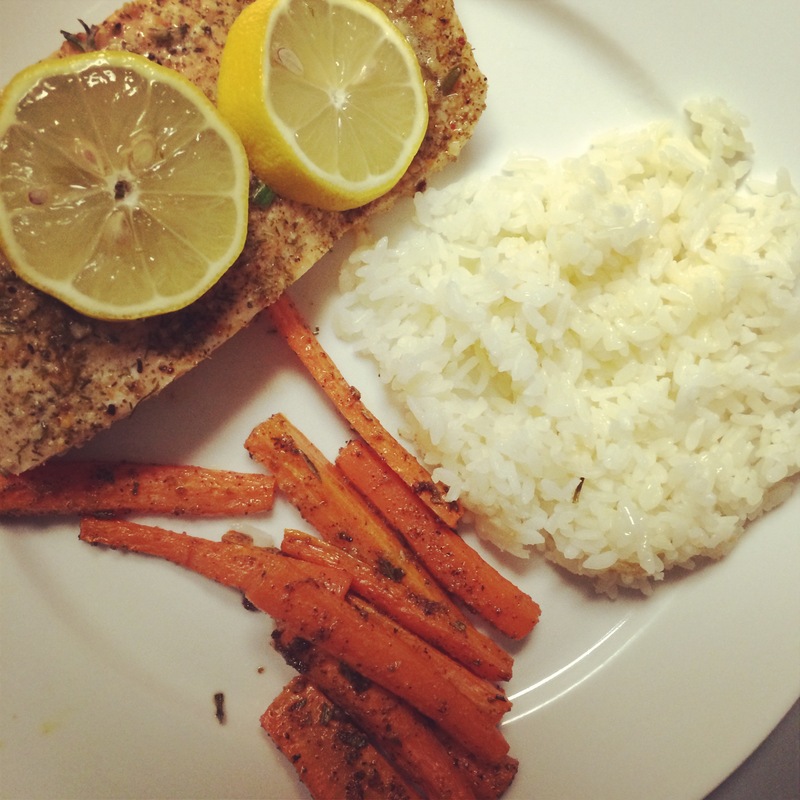 I baked the carrots about the same time as the salmon. Everything came together at the same time and was absolutely delicious! The best part: the whole meal was around 600 calories. I have a book of soup recipes that I’ve been slowly working my way through. I wish I could say I’ve tried a bunch but somewhere between last winter and this one, I’ve slacked off and only cooked about 5 or 6 of the recipes. There are so many in there to choose from. Of the handful I’ve made, most were pretty decent. The good thing about this book is that it’s broken down into chapters according to the protein and there could be several variations of a similar recipe you can choose from. For example, this recipe came about because of what we had on hand. I had 1/2 a pound of ground beef I had to use up and looked at the 4 different beef taco soups in the book. I ended up picking this one because I had almost all of the ingredients it called for. In a large saucepan cook the beef and green pepper over medium heat until meat is no longer pink, drain. Stir in taco seasoning and water. Cook for 5 minutes or until liquid is reduced. Add V8 juice, bring to a boil. Reduce heat, simmer uncovered for 5 minutes or until heated through. I didn’t have green peppers and I didn’t have enough V8 (only 2 cans were left) so I added a can of Rotel. It made up the difference on missing 1 can of V8 juice and it also had diced chilies in it. It worked! I wasn’t too concerned about the spicy V8 being too spicy. It’s the V8 I use when I make my Bloody Mary’s and it’s fantastic. But…yeah, two cans of spicy V8 is pretty damn spicy! I told Michael I hoped it was edible and not too spicy. I followed the recipe’s instructions and served it up with some shredded Colby Jack cheese, a spoonful of sour cream and some corn tortilla chips. It was indeed edible and the sour cream and cheese helped to offset the spiciness. The dinner was delicious! I was glad it turned out and marked it as a winner in the cookbook to definitely make again. Even better: it’s less than 500 calories for the soup and toppings! 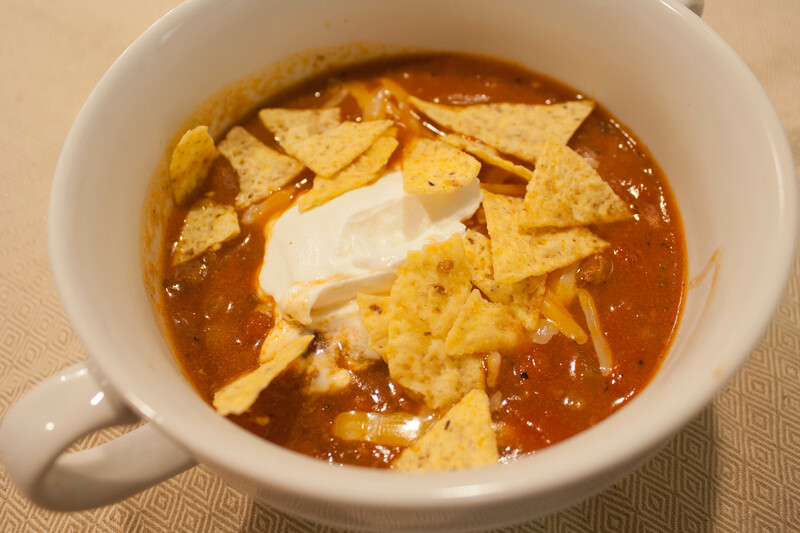 I will make the taco soup again and probably VERY soon, too! 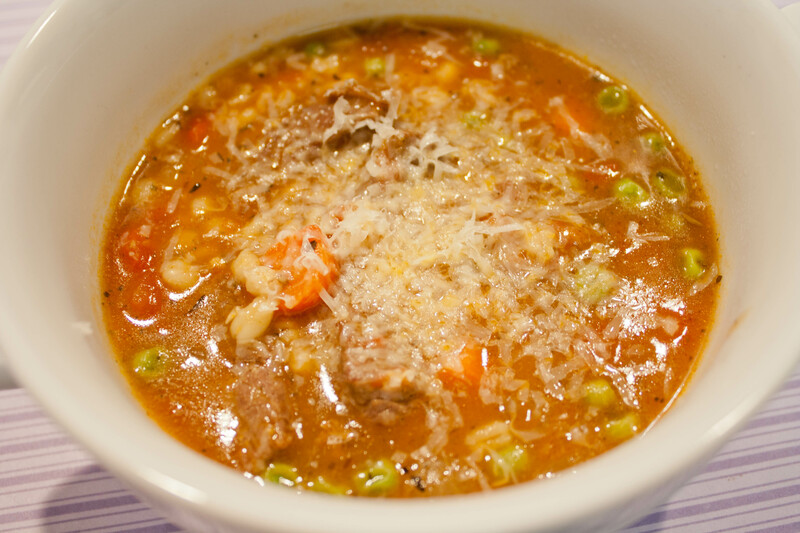 The beef barley stew looks great (I dont want the steak either) do you know the calories and do you have the recipe for it? Yes, the recipe is posted and if you look at the top just under the name of the recipe it has the calorie and serving info. Mmmm that taco soup looks amazing! It was! I want to make it again. It was great. All 3 of those recipes look tasty!! I just used barley for the first time about a week ago (not sure what took me so long) – now I want to use it a lot. 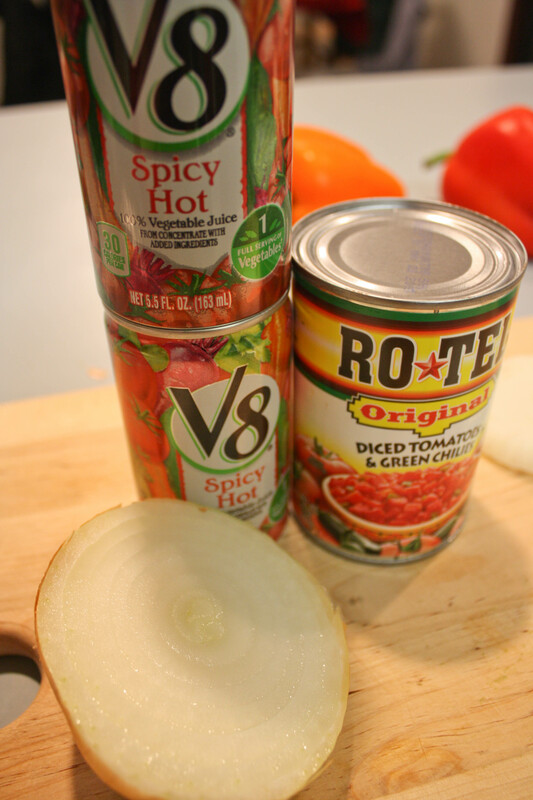 And, as many times as I’ve made taco soup, I’ve never used spicy V8 – can’t wait to try it!! This recipe was the first time I tried barley, too. Loved it! I have a few other barley recipes I’m looking forward to testing out. I LOVE taco soups, that looks great. It was really tasty! I would make this again in a heartbeat and probably use it as a base to create other taco soups. I didn’t try barley until last year I think – I made a beef and barley chili that was pretty good! Biz recently posted..I Want to Be A Spartan. What a great idea! I love the idea of barley in chili. Yum!